I think a major part of that conflict will be driven by how technology also constructs social formations. The bicycle’s existence was made possible by the same industrial technology that created the class system that got to define its use. It’s a two way street. We shape technology as it shapes us. Absolutely, William. The notion that there relationship between society and technology, in which one shapes the other but not vice-versa, is annoyingly persistent. Technology and society exist in a constant state of mutual feedback, and in many cases it isn’t even possible to tell where technology ends and society begins. I have take exception, however, with the idea that industrial technology created the class system. It certainly changed it, by making financial capital (rather than just land) a lot more important for economic activity, but I think that a medieval peasant might get pretty angry with you if you suggested there is no class system in her time. In the case of smart phones, I think it is obvious that whatever final form they take, it will have a massive influence on social relations. I think that most people realize this, and projections of the social influence of the new phones will play an important role in the ongoing conflicts over their development. I predict that a lot of people will oppose Google Glass, for example, because they don’t want a future society in which everybody is perpetually “plugged in”. Others may embrace that possibility. Sorry, I wasn’t quite clear enough in my reply. I meant that industrialization created the particular class system we have now. I totally agree that class systems in various forms have been around since basically the birth of civilization. But yeah, the relationship between technology and society is mutual, and I think an important thing to realize is that makes technology not value neutral. Since technology’s uses are not strictly defined by social values, and it can create social values as well. Like how the development of the steam engine completely remade human society, changing the value placed on hereditary status to one based on capital ownership. And it wasn’t a process we were, and are, exactly in control of. I think the difference in the times of that bicycle and smartphones makes your argument lose a little. Those days were dominated by class structure. Smart phones today do NOT want to be limited to the upper class, as the best return on investment comes from the masses. There’s some truth to that. Social structures were certainly different in the early days of the bicycle, meaning that social class was one of the main variables that could dictate the kinds of user groups that used a new invention. 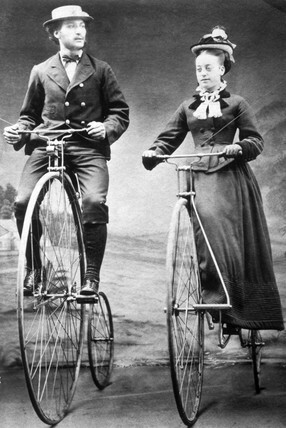 But by the time bicycles became popular, the industrial revolution had already happened, meaning that production could be expanded to fit any conceivable demand. So then as now, the best return on investment came from the masses. The important question to ask, however, is WHICH masses. While class is less of a factor today, the fact remains that not everybody needs a smart-phone for the same thing. This means that the basic functionality of a smartphone, the criteria by which we judge which phones work well and which ones don’t, is subjective and open to interpretation and redefinition. Since virtually all consumer technology tends to settle on a single basic configuration, that means that somebody’s particular definition of what makes a good smartphone is going to win out over the others. The final, standardized configuration will privilege one particular use environment.